Hello! I'm Elly. Until the age of seventeen I ate basically nothing except cheese sandwiches. Food had no interest for me and I was notoriously picky. When I had to go on a French exchange with school, aged fourteen, we were asked to send the family a letter advising them of what we didn't eat. I wrote 'pasta, and rice'. Yes, readers: two of the blandest foods imaginable. There was no hope for me. Fate intervened. Aged seventeen, I got a job as a waitress in a restaurant that championed local, organic food. Every day at work was a voyage of discovery. Greengages, crème caramel, Tunisian citrus cakes, Moroccan tagines, lentils, feta, butterbeans - I had never heard of, let alone tasted, any of these things. Fortunately, I promptly fell head-over-heels in love with the chef. Desperate to impress, I forced myself to try these alien foodstuffs when he offered them to me (pickled fennel? Duck liver pâté? WHY WOULDN'T HE LOVE ME BACK) and even to start cooking his recipes myself at home. Helped along by my mother, who started sneaking cookbooks into my Christmas stocking, I was soon producing plates of marinated feta salads, bean soups, north African stews, pasta carbonara, fruit tarts, sorbets and all manner of interesting creations that were about as far from a cheese sandwich as you can possibly get. I did a BA and a Masters in English literature at Oxford University, and spent those four years dividing my time between writing essays and cooking every weird and wonderful ingredient I could get my hands on at the market, apparently desperate to make up for lost time. I never had to resort to cooking pasta in a kettle by sellotaping down the 'on' switch, which I consider probably the finest achievement of my university career. My journey towards culinary aptitude was occasionally plagued by those hazards perennial in all student kitchens: food thieves, a lack of utensils, forgetful people who leave freezers open overnight and a constant film of grease on every available surface and appliance no matter how much washing up liquid is applied. Oh and yes, that standard bête-noire of all student houses, the housemate who decided his jugged hare had not been quite jugged enough by the butcher and somehow managed to spatter hare blood all over the worktop, walls, and even inside the kettle. I started writing a food blog while working for my Finals in April 2010. This was an ostensibly ludicrous move, but I think it helped to keep me sane during a three-month period in which I had quotations from Chaucer taped to the mirror above my sink and had to stop drinking any caffeine whatsoever because it was making me afraid of my own heartbeat. I started it as a place to document the daily bursts of mild euphoria that come from unleashing your creativity upon edible substances, to chronicle occasions like the one where I went out to buy a pint of milk and returned with a smoothie maker and six wood pigeon, grew and cooked my own lemongrass, or plucked and roasted two partridge from scratch. Food bloggers always get asked what exactly it is they love about food and cooking: for me, the joy comes from having a hobby that I can get excited about at least three times a day. Sometimes you just need to kneel on the ground and take photos of a bottle of gin. Right? I eat nearly everything, except parsnips (I've never yet found someone who shares this dislike; usually the revelation is met with fierce consternation). I am obsessed with fruit. Having a nearly-empty fruit bowl makes me nervous. I love all fruits apart from a strange thing I once tried in Indonesia that is called a 'snakeskin fruit' and tastes every bit as it sounds. I try and sneak fruit into all my recipes, sweet and savoury, and feel it is my mission to show the world that fruit can and should be a part of every meal. Crisp slivers of glassy pear in a fennel salad, for example, or chunks of juicy mango in a chickpea curry, or wedges of apple tucked alongside roasting pork chops. I sometimes meet people who say they 'just don't get' fruit in savoury dishes. I don't really understand these people and feel they must be somehow defective. The subtitle of this blog is 'fruit and spice', although I take 'spice' to be a fairly general category that covers all the little additions you can make to food to turn it beautiful. A dusting of cinnamon, of course, but maybe also a smattering of smoked sea salt, a trickle of gooseberry vinegar, a little dried orange peel powder, a few drops of mandarin-infused olive oil or a pinch of vanilla salt. I love the little things that enhance the main event; my kitchen cupboards are packed with flavoured salts, sugars, oils and vinegars. I'm also a breakfast fiend, an event that I hold sacred and is probably the meal I find most inspirational. Another inspiration for me is the great British pudding: I shun fancy French-style patisserie with all its swirly cream and piped chocolate in favour of big, hearty, stodgy puddings, the kind that isn't out of place after a huge Sunday lunch. I also love food that is frugal, that uses unloved parts of an animal, fish or vegetable or that turns leftovers into treats. I've recently started growing my own fruit and vegetables (tomatoes, courgettes, Swiss chard, red peppers, lemongrass, pandan leaf, kaffir limes, chillies...) and butchering my own game. It appeals to my neurotic and hard-wired obsession with productivity and setting myself practical challenges, but in a way that tastes nice. Closely linked to my love of food is my love of travelling. This sounds romantic, possibly a bit pretentious (did I also mention I love yoga, farmers' markets and a good flat white coffee?) but the reality is I am incapable of leaving the UK without some nerve-shredding disaster occurring (recent highlights have involved bomb scares on planes, bedbugs, lost luggage, missed flights, altercations with Cambodian airport staff, earthquakes and a panicked text to travel companions during a trip in Syria telling them they 'might have to call the embassy' because our car radiator briefly overheated). I collect recipes as souvenirs, hoarding scraps of inspiration from restaurants, cafes, street food wherever I go. South-east Asia is my favourite destination and in the last four years my cooking has tended to revolve around that type of food. Sometimes I go to other nice places but I wonder where the chopsticks and the durian fruit are and it just isn't the same and I always feel a tiny bit sad. I recently completed a PhD in children's literature at the University of York, and I am now working on a postdoctoral research project at the University of Aarhus, looking at representations of adventure in children's literature from the nineteenth century to the present day. Alongside books and food, I love gardening, reading, walking, cats, yoga, painting, tea, horse-riding and swimming. I also work as a freelance food/recipe writer for various companies and publications. This is my 'default photo face' when food is around. The title 'Nutmegs, seven' is taken from Shakespeare's The Winter's Tale. The full quotation is: 'I must have saffron to colour the warden pies; mace, dates...nutmegs, seven; a race or two of ginger, but that I may beg; four pounds of prunes, and as many of raisins o' the sun'. I chose it when I set up this blog; it encapsulated my three main interests then, and it still does now: literature, fruit and spice. And, er, pie. I love hearing from readers of this blog - if you've tried the recipes, have any questions or just want to talk about food, please get in touch. My recipes have been featured in the Guardian and the Mail on Sunday Magazine. I'm currently a recipe writer for Great British Chefs, AO at Home and Avant Homes. 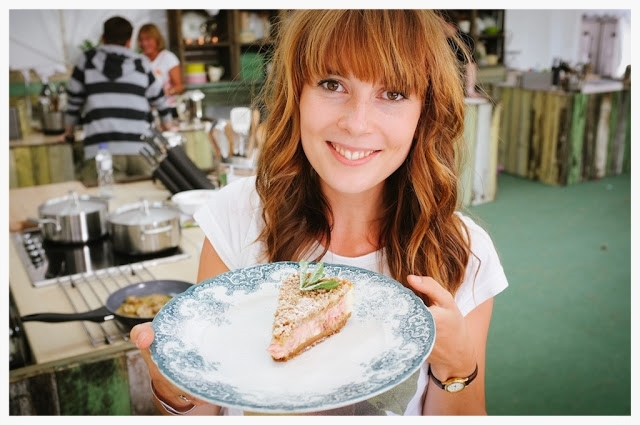 In April 2013 I appeared in the first two heats of ITV's Food Glorious Food. In April 2015 I was shortlisted in the Online Food Writer category at the Fortnum & Mason food and drink writing awards. In June 2016 I won Food Blog of the Year at the Guild of Food Writers Awards, and in 2017 was shortlisted again for the same award. If you are interested in working with me, please get in touch.